Shapell’s/ Darche Noam is excited to announce that the fourth annual David Shapell z”l Memorial Married Couples Fellowship has been awarded to Simcha and Sabrina Brick. 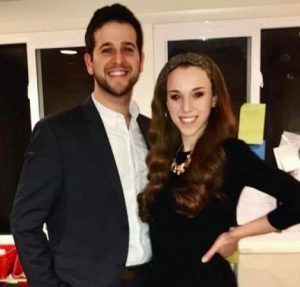 This extraordinary couple will spend the 5780 (2019-20) academic year studying at Shapell’s/Yeshiva Darche Noam and Midreshet Rachel v’Chaya, which will include participating in special classes and programs designed for young married couples. This prestigious fellowship will provide their full tuition and subsidized housing, thus allowing them to spend their year focused on their academic, spiritual and leadership growth. A native of St. Louis, Simcha grew up in a family actively involved in the Jewish community. He was always interested in learning more about Judaism. After completing his degree in creative writing at Binghamton University in New York, he studied at Shapell’s/ Yeshiva Darche Noam from 2014-16. His professional roles have all been in Jewish education (both formal and informal). From 2010-2015, he acted as the “Camp Rabbi” for a small camp in Southern Illinois, Camp Ben Frankel, teaching about Judaism to students from elementary school through college. In 2016, after leaving Shapell’s, he became the director of NCSY’s “Jewish Student Union” in Houston, running programming and classes for Jewish teens in public schools. He also taught Jewish philosophy and history in a local Jewish high school, Beren Academy. In 2018, he was promoted and made the NCSY Director of Westchester County in New York. Sabrina grew up in Metuchen, New Jersey in a proudly Jewish home. She went on to study journalism at Rutgers University and simultaneously became involved with Rutgers Jewish Experience/Meor on campus. Subsequently, she went on three Jewish learning trips, including Pathways Plus at Midreshet Rachel. Her first job after college was as a production assistant on CBS This Morning, where she worked for about eight months before leaving and spending almost a year and a half learning at Neve and as a madricha for MEOROT, NCSY’s gap year seminary program in Israel for public school teens. Already having decided to give back professionally to the Jewish community, she spent this past year doing outreach in private and public schools for Brooklyn NCSY, working part-time for Souled NYC, the women’s division of Meor Manhattan, and just recently began writing for Mishpacha 2.0. For forty one years, Shapell’s/Darche Noam in Jerusalem has been giving English speaking adults the skills to be independent and engaged in their Torah learning, to be deeply connected to the Jewish People and to Israel, and to become leaders in their community. The Married Couples program is a signature program that allows husbands and wives to study at the Yeshiva and Seminary in the regular learning programs, as well as providing them with special classes designed for married couples focusing on marital harmony, parenting, practical halacha in the areas of Shabbat and Kashrut, choosing a community and more. The David Shapell z”l Fellowship was created by alumni who wished to honor the memory of Mr. Shapell, who, along with his wife Fela, are our long-time benefactors who particularly appreciated our focus on strengthening both Jewish families and communities.